Let’s talk about the mighty Google sheets. Mighty? Yes! It is one the best spreadsheet apps on par with Microsoft Excel. Actually, Google sheets is better than Excel in few cases because of its features like Apps script, Timed triggers, Form triggers, Google sheets API, importXML etc. Let’s talk about different advanced features of Google sheets, its limitations, alternate solutions and how to use those features and how to use Google sheets as a database! Don’t even get me started on the number of integrations available with Google sheets App script such as MailApp, DriveApp, DocumentApp, SlidesApp, CalendarApp etc! These are just a few examples. The possibilities are endless! It’s all good as long as the data is within Google products. Once you want to read or write data outside of Google, however, the problems start. Let’s say you have a list of employees and their metrics in a google sheet and you want to display it on your company website. How to use Google sheets as a database? This is when Google sheets API comes into the picture! Google Spreadsheet API can be used to read and write data to google sheets. Sheets API can be consumed to use google sheets as a database! Here’s a sample response for a simple list with 2 rows of data. If you are a developer then you surely know that this API response is not really useful! So what are the alternatives to Sheets API? I’ve tried a few libraries which simplify the API response and provide some useful methods but most of them are deprecated and support only public sheets and also don’t support writing or updating data in google sheets. Finally, I found this platform called Sheetsu. One platform that simplifies google sheets API to a great extent and helps to use google sheets as a database. Sheetsu is by far the best platform I’ve seen that leverages most of the capabilities of google sheets. Let’s see what features does Sheetsu offer and how we can use them! Sheetsu is a platform for both developers and non-developers. Some of the features can be used by anyone without coding experience and some advanced features like JSON API can be used by developers to convert google sheets as a database. HTML form to Spreadsheet integration – Of course, This feature is already built-in with Google forms. 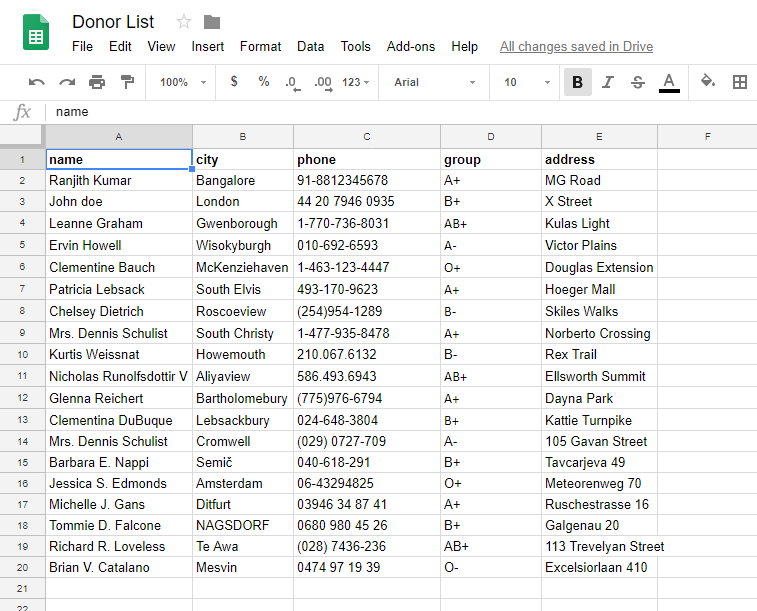 We’ll be talking about JSON API and how to use it to build a simple blood donor app via google sheets as a database. Go to Google sheets and quickly create a blank spreadsheet. Let’s understand how Sheetsu’s JSON API can be consumed. 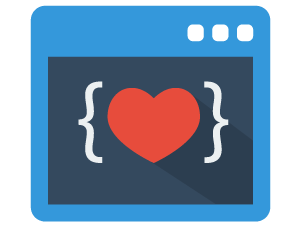 This API supports GET, POST, PUT, PATCH and DELETE methods. Data can be filtered using search queries, set the limit and offset for pagination support. It is as good as an actual API with a full-fledged database. API requests can be secured using API key and can also disable methods if required. Let’s say you want to disable updating and deleting of data then you can disable those methods and you are good to go! Reading data is just making a simple GET request to the API. Click on the link below to see the response. Creating a new row in google sheets via API can be done by making a POST request with row data in the request body and Content-Type header with value application/json. Multiple rows can be added by sending an array of objects instead. Updating rows can be done in a similar way using PUT and PATCH methods and deletion can be done using DELETE method. Beginners 👶 who don’t have experience working with APIs might be wondering how to actually use these in a web app or mobile app or website. So I made a simple practical example to help the beginners understand better. It’s a simple web app where users can see the list of people who are ready to donate blood and they can also submit their own details for donating blood. So There’s Name, city, phone, group, and address columns. I’ve used Bulma CSS library to quickly style the web app. Look at the search function once. First app.loading is set to true to show a loading spinner while API call is being made. I’m using encodeURIComponent function in Line 3 because blood group has special characters like + which needs to be URL encoded. Remember to encode your search parameters if it has special characters. donateBlood function runs when users submit “Donate my blood” form along with their details. User’s data is set to donorData object. Use Sheetsu.write method to add a row to google spreadsheet. A simple Thanks you alert is shown when the API call is successful and donor is added to the list! Google sheets is not a full-fledged database so when should you use google sheets as a database? Let a sales team or HR team use google sheets as a database and quickly display some data on the company website. This is a long blog post that I’ve written after a long time 😵 I tried to put out as much information as possible with regard to using Google sheets as a database. If I’ve missed something or if you have any questions or feedback then do let me know in the comments below! I would like to use Google Sheet as a database on WordPress, simply to display the table, without using the Google Sheet embed native system. Do you think this is possible? Hi William, You can use Sheesu’s table feature for that. Did you check it out? Thank you for this post but I need some information can I use this code in localhost or my pc server, If possible but how? Hi Raihan, You can do that. What language are you using for your app? I thought about using Google sheets for a project which would hold loads of private data. If I could store that data in sheets from the user itself it would give users ownership over their own data. The only concern I have is performance. What where your experiences on that part? Are queries slow or acceptable? Hi Tomas, The queries were a bit slow from my experience. I wouldn’t really use google sheets for a private database as well. Good Stuff!! I can’t wait to do it! Thanks.. I’m struggling up the learning curve. Hoping to be able to use google sheets for a food truck business database. Hi Ranjith, I’ve just read through your article, you did mention about private sheets: will it be possible to GET data from a read only sheet for my python application if the sheet is private? How does it refresh tokens or whatever it must do so that I don’t need to re-authenticate every month? If I have a company sheet that I have readonly access to, can sheetsu get that data? Hi Rajdeep, I think they recently changed their limits to their free account. I’ll talk to Sheetsu team to get special limits or discounted price for our readers. Any additional news on this limitation? I hope Sheetsu has increased the number of searches to more than 200. Hey Ranjith, great article! Is it possible to have multiple blood types in one cell? Say I search for A+, could it return a hit for a cell that had A+, B-, O+?